The first intelligent chatbot for global mobility. MAIA works in partnership with MoveAssist’s flagship product mai-assignment and as a result can access all of the information related to a company’s employees and their assignments. MAIA will be your team’s personal assistant equipping you with 24/7/365 support for your global assignees. 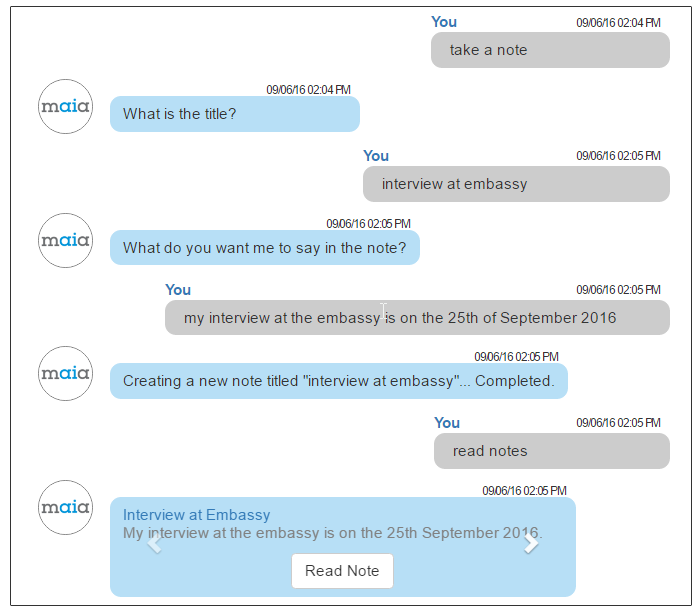 Using Natural Language Processing (NLP), MAIA simulates conversations with human users and can answer a whole host of questions saving you both time and money. Talk to MAIA as you would a friend and MAIA instantly searches the mai-assignment database for the information you require. Forgetful? Ask MAIA to remember your important information. MAIA can help improve your employee's 'on assignment' experience by equipping them with local knowledge on-demand. Need to speak to a human? No problem. MAIA can phone or email any of your contacts and even remind you that it might be out-of-hours at their location. For any company with a large mobile population or with employees spread across different time zones, MAIA provides a consistent, always-on support facility with up-to-date and relevant information. While a chatbot will never replace the personal touch, MAIA can lighten the load on the mobility team and free up time by handling every day requests and dramatically reducing the number of emails sent and received - time that can be better spent in developing a more strategic approach to mobility and improving ROI.